This article first appeared in the St. Louis Beacon: The 2013 U.S. Junior Closed Championship -- the nation’s most prestigious invitational tournament featuring the best players under 21 – is getting underway in St. Louis. This event has the reputation of offering a few more fireworks than the U.S. Championship, which just concluded here last month. While the U.S. Championship typically showcases computer-like precision with every move, the Juniors often provide action that accurately represents kids at play. With the reward so high – more than $10,000 in prizes and an invite into next year’s U.S. Championship with the big dogs – the risks taken are routinely just as grand. The Junior Closed Championship is often the biggest stage on which many of these players will ever compete, creating the perfect mix of performance pressure, emotional desperation and the wild imagination of the young mind. 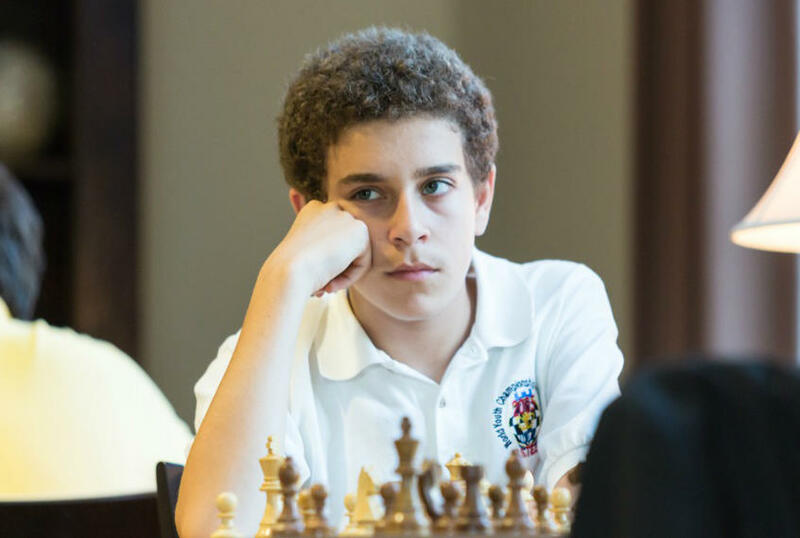 International Master Daniel Naroditsky, 17, will be the top seed at this year's U.S. Junior Closed Championship. That’s not to say the talent is any less impressive – perhaps quite the opposite, considering age. The 10 players who will battle in the Central West End over the next two weeks are all model prodigies, each flaunting a fully mature intellect that doesn’t match the size of their bodies. In fact, Sarah Chiang, a 16-year-old out of Dallas, finds herself on an uphill climb for her second consecutive trip to St. Louis. Chiang was here last month competing in the 2013 U.S. Women’s Championship, a tournament that outranks the Junior Closed in pure prestige – but apparently not in the competition pool. The average rating of the top 10 U.S. women was 2365, while the average rating of the top 10 U.S. juniors is 2460. As a parent, I find myself extremely intrigued with the upbringing and surrounding family life of these prodigies. I’m not sure whether any chess journalist sat down to chat with Bobby Fischer’s mom back in the day, but it seems like a natural angle to me considering most of these chess superstars have likely spent more time in the back of a minivan than a limo. Vladimir Naroditsky used to travel heavily over the summer, so he taught his son Daniel, 6 years old at the time, how to move the pieces before he left – just to keep the boy occupied. When he returned in September, Daniel was doing more than moving pieces; Vladimir could barely hang. Four months later, Daniel became a scholastic champion in California. I asked Vladimir when that “whoa” moment came for him, when he first realized that his son had transcended from normal to extraordinary, and he told me about the Western Open, a large regional tournament in Nevada when Daniel was 10. These big games tend to be five- or six-hour affairs, so Vladimir had dropped Daniel off at the tournament hall before the start of the fourth round and headed back to his hotel room. But Daniel came bursting through the door – distraught and in tears – not five minutes later. Apparently, after seeing the young child walk to the front of the room and plop himself down at the first board, the tournament director kindly informed him that “this tournament was for adults” and to please vacate the chair. It took some time for Vladimir to convince the TD that the boy actually belonged in that seat. That’s the storyline I love for the Juniors. All of these players hold this innate ability, this gift, to walk into any room full of adults and completely overturn it – while simultaneously being prone to suffering a few embarrassed tears and a run back to a parent’s embrace. Meanwhile, the rest of us – those in the room full of grown-up experience – are left shaking our heads in disbelief: That kid is not supposed to be here. Daniel is 17 now, has written two books and is the highest-rated Junior in this year’s field at 2538. These days, he’s more likely to cause tears than to squirt them around America’s chess halls, but that’s the theme behind all of these players. The playground is about to get rough. The games will be played daily through Sunday, June 23, with the first round at 1 p.m. June 14 in the upstairs tournament hall of the Chess Club and Scholastic Center of St. Louis in the CWE. That aforementioned room full of adults will be in the downstairs classroom, where Grandmasters Yasser Seirawan and Ben Finegold will provide live play-by-play commentary to spectators. Check out the details, and get the background scoop on more of these up-and-coming superstars at www.uschesschamps.com.